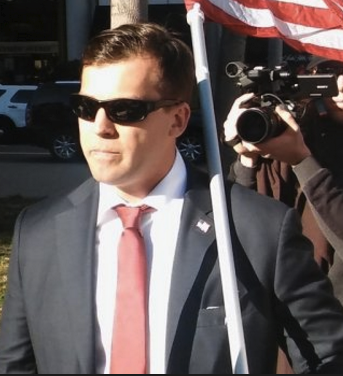 Republican U.S. senate candidate and Holocaust denier Patrick Little has filed paperwork with the California Secretary of State that lists his address as an apartment located in a student housing complex owned by UC Berkeley. The address under file with the Secretary of State is in the city of Albany, which is just north of the city of Berkeley and where the university owns an apartment complex called University Village. A spokesperson at Berkeley says that no person named Patrick Little is currently enrolled at Berkeley, nor has anyone ever been enrolled at the university who has that name. The spokesperson could not identify the person who lives at the Berkeley-owned apartment associated with Little’s campaign. Little’s Twitter account says that he lives in Albany, CA. He was thrown off the social media site on April 29 over his denial of the Holocaust and wrote that "Hitler saved more jewish lives than any man in history." Gilmore sent along information about who may qualify to live in the University Village complex: full-time graduate or undergraduate university students, and their families. Little, who is married, jumped from obscurity into the national news this week when it was revealed, in Newsweek, that he is the top-running Republican candidate in the race to unseat Sen. Dianne Feinstein. With no apparent campaign staff or apparatus to speak of, he came in with 18 percent support in a recent statewide poll, and was number two after Feinstein. If the polling numbers hold and are reflected in the primary vote on June 5, Little would face Feinstein in the general election in November. A spokesman at the Federal Election Commission says that candidates for higher office don’t have to reveal their home addresses, and only need to provide a mailing address to the FEC. Little has not filed a Statement of Candidacy, or any other disclosure reports with the FEC, says Martin. He may not need to. The FEC only requires financial disclosures from candidates who haven’t eclipsed a $5,000 threshold in contributions, or expenditures related to the campaign. Little has said that he’s told his supporters to not contribute any money to his campaign, given that those contributions, and who made them, could be subject to public scrutiny.